One of the older hawker centres located in the heart of Chinatown, Singapore, it was certainly worth a visit. At the point of writing, surrounding areas of the hawker centre were still under renovation and construction, so a detour was required to gain access to this food haven. It certainly was a sight, when you zig-zag through clusters of old folks sitting around playing chess or just to chit-chat. Upon arrival at the food complex, you would be greeted with a complete new face of working professionals and working adults in their office wear being part of the long queues at many of the food stalls. The stark contrast was almost hard to ignore, especially during the peak lunch hour. (+) Evenly deep-fried, which explains the very crispy pastry shell crust. (+) Generous rich serving of thick curry with chicken, diced potatoes and portioned hard-boiled egg. (+) Flavoursome ingredients and curry was well seasoned and thick enough not to ooze out at bite-point and create a mess. (-) Not recommended for foodies who enjoy fluffy and soft curry puffs. 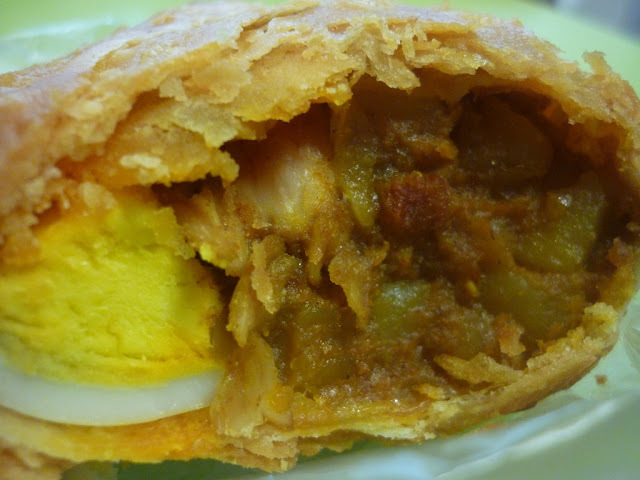 (-) The pastry shell of the curry puff was not exactly aesthetic. (-) Vendor was wheeling in cans of sardine in tomato sauce for their preparation. (-) Burns your tongue if you are not careful! 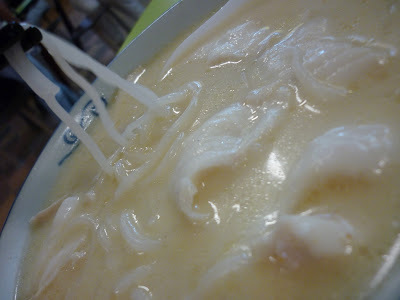 (+) Luscious fish soup, not overly masked by thick ginger slices nor repulsively 'fishy'. (+) Evenly proportioned and sliced fish pieces. (+) Generous serving of the soup and fish slices. (+) Bee Hoon was al-dente and shortened for ease of consumption. (+) Unique and probably one of its kind to be found in local hawker centres. 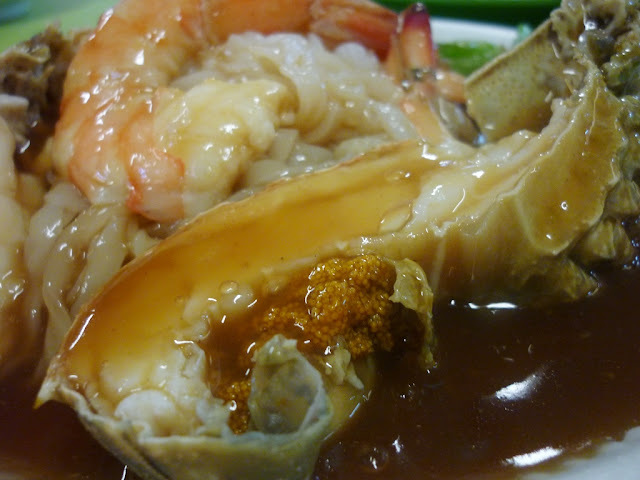 (+) Generous serving of 1 whole crayfish with roe and several large prawns. (+) Thick and very flavoursome gravy and you could distinctly taste the 'seafood-ness'. (+) Hor Fun were soft, henceforth a perfect element to the overwhelming gravy. (+) Fresh crayfish and prawns were used. (+) Very succulent flesh, springy and definitely bursting with flavours. (+) Perfect for seafood-lovers, price and quality wise! (-) Definitely a no-no for people who cannot stand overwhelming seafood aroma. (-) You either love it or hate it. (+) Very tasty, well braised pork ribs, with a well-seasoned gravy drizzled over. (+) The tendons were well-cooked, snaps with each bite and you can have a good crunch! 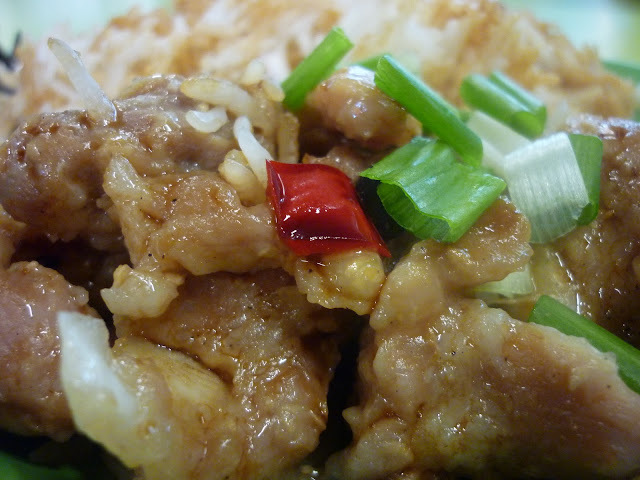 (+) Generous serving of rice, good for the budget conscious looking for a filling meal. (-) Too much rice relative to the serving of ribs. (-) The gravy was slightly diluted, and we believe that if it was more concentrated, it would heighten and enhance the taste of the dish greatly.